53 Davies Street is on the corner of Davies Street and Brook Street, diagonally across and along from Claridge's Hotel. 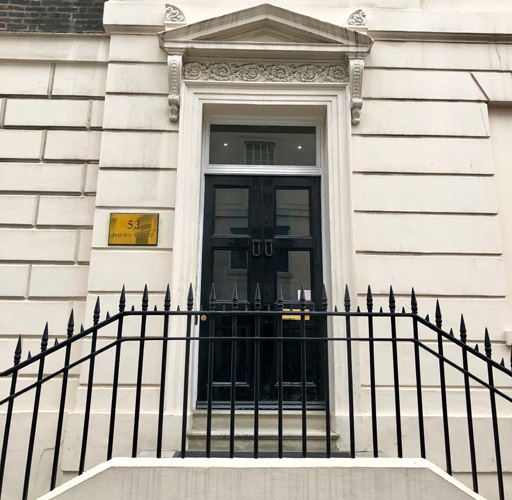 It's a large, slightly anonymous black door facing onto Davies Street, with six steps up either side and often a row of motorcycles and mopeds parked outside. It's a short walk from the Bond Street Tube. (Please note that, as a heritage building, 53 Davies Street does not have disabled access. If you use a wheelchair or have other mobility issues, please indicate this and an alternative location can be arranged). Within reception hours (Fridays 9-5pm), press the CALL button to access the waiting area. Outside reception hours, you will be given a direct telephone number and Dr Lorimer will let you in himself. Clients are advised to check their appointment offer and confirmation emails for details of their consultation.